Dealing with a number of airsick children we ended up getting off the plane last. This didn't just mean less crowds, it meant eerily quiet corridors where we had to follow the signs to almost deserted areas to go through the various stages of customs and transferring planes. Once more we had the alleged improvements of technology. We were required to enter our details as a family which mean scanning every passport into a self service kiosk and each of us recording our fingerprints and having a photo taken. Eventually, wth a little assistance, we received 7 slips of paper which we took to the customs official. He then took the papers and passports and made Lana, Peter and Clare record their fingerprints again, take another photo and scan everyone's passport. Because that is what technology can do for you. Each passport was stamped and we were told to move on. Following the signs we reached the carousel and met others of our flight who were still waiting for bags. We then proceeded down a few more corridors to the connecting flight area, stopping briefly to retrieve a change of clothes for those who had remnants of air sickness on their clothes. Our two bags were then put in the connecting bags area and we made our way down another corridor and into a queue to get scanned for the internal flight. Once again we had to pass over our passports with matching boarding passes which were scanned and each person checked. Then we had to encounter the TSA. I am amazed at the low level of service provided by the TSA staff. It was obvious we were a group with young children but they were going to split us up by age so that older people go into the full body scanner and the rest through the normal scanner. We gave him a questioning look and he relented and sent us all through the normal scanner. But my computer, which I had taken out of its bag and then placed the bag on top, was diverted for additional screening. We spent about 20 minutes watching incredible slow processing by one officer of a previous person's bag while 4 other officers engaged in lots of private chatter ignoring us and another who were waiting. This guy had his bag completely emptied with its contents put into another tray and after being told all was OK was given the tray and told to put it all back together "over there". Then she went off leaving two bags still awaiting additional analysis. One young officer saw us and another fellow waiting unsure what was happening, and relented by assisting the now missing officer. He quickly sorted out the other bag prior to ours then he got to mine. The reason why I had been delayed for additional screening? The initial scanning officer could not work out that the bag and computer were separated with the bag on top so it was put in unknown. Next time I will make sure they are in separate trays. I can now understand the level of animosity and frustration with the TSA security theater. From here we finally went to where our plane was meant to be, gate 151. While we all used the restrooms, Lana heard an announcement something like "blah blah blah Atlanta blah blah blah gate 63." The "Blah blah blah" is a rough summary of the coherence of the spoken word over the PA system. Checking gate 151 we saw that the plane destination was no longer Atlanta. In most other airports there are boards in many places listing departures and arrivals. But not at this terminal in LA. I found someone who might know what they were on about and asked hime where these information boards might be. Looking at me as if I was blind he pointed almost directly upwards. On the roof was the departure gate information. Except that for the Atlanta flight the gate was listed as blank. We only had 20 minutes before scheduled boarding so I wasn't going to hang around waiting. I went up some escalators to one of the airline lounges and they informed me the new gate was 63. This was in another terminal completely which meant down this corridor and that one, round a bend, spin three time and click your heels and then catch the shuttle. Aargh. I stood at the top of the escalator and waved at my family below who were not paying me the slightest attention. So I raced down the escalator, collected everyone else, we all raced back up the escalator and went down the corridor indicated. At the end of the corridor the signs stopped mentioning terminal 4 (which we were told to aim for as an obvious means of getting to terminal 6) and we had multiple options as to which direction to take. We were just outside the Qantas lounge and the fellow in there noticed our confusion and popped out asking in a very friendly Australian accent whether we needed assistance. He pointed out the way we had to go and called ahead to let the plane know we were on the way. Thank you Qantas guy. You rock. We found the shuttle area and had to wait for the next bus as other poor lost souls in the same situation trickled in. The bus arrived and we made it to the new gate just as the delayed boarding was beginning. This time we were in three different places on the plane. Lana was with Clare and Rose, I was with Zach and Peter was with Martin. Just as we buckled in Zach told me, "Guess what Dad?" "I need to go to the toilet," he said with a grin, unbuckling his belt. 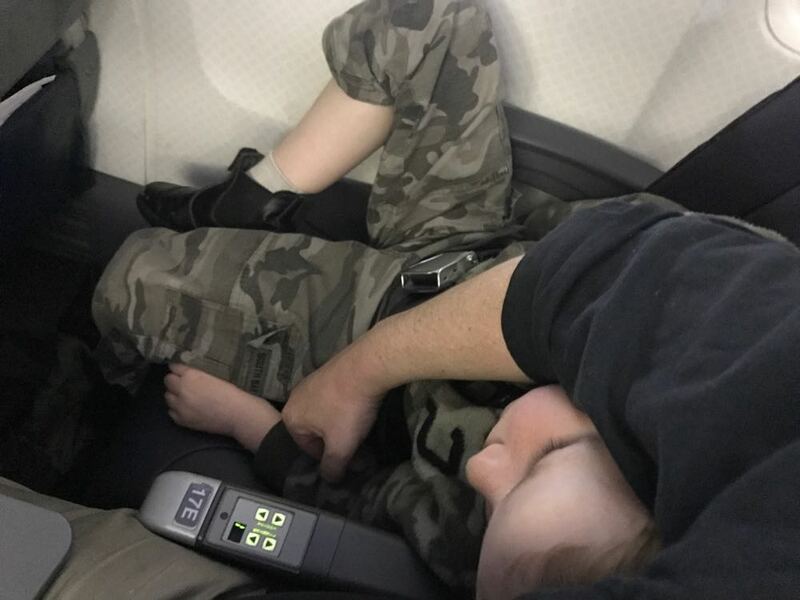 "You'll have to wait until the seat belts sign is off and we are in the air," I told him so he sat down and buckled up willing to wait. He handled the travelling very well. 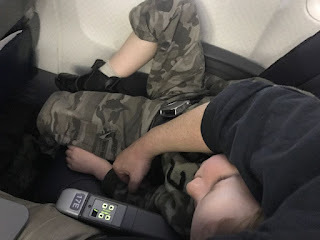 Once we were in the air I turned to him but he was very fast asleep in a position that, if it was me, would have necessitated a chiropractor visit. That is the photo above. Looking across, Martin was asleep too. Meanwhile the girls were not having fun. Rose threw up before the plane took off. The air steward looked on and suggested Rose might be too sick to fly, but Lana quickly explained it was just air sickness after a very long flight and we were allowed to continue. Rose was sick a few more times into the readily available garbage bag but all in all we were very glad when we finally landed and arrived in Atlanta.